Schlack's victory on the Everest Summit. Notice the determination in the facial expression. Paris, FRANCE -- The Tour de France 2011 just came to an exhilarating conclusion today and already cycling aficionados worldwide are labeling this race as the most controversial Tour ever. Let's examine in details the events that unfolded over the last few weeks. It all started during the prologue when Englishman David Millar presented himself as naked as a jaybird on the starting ramp in order to "minimize wind resistance" and by his own admission, "feel the invigorating breeze on my groin area." It seemed the unusual tactic worked since he had the best intermediate time until he took a nasty tumble at 35 mph, effectively ending his Tour aspirations and his days as a ladies' man. The staff had to use high pressure water sprays in order to peel his skin off the road. During the flat stages, it was a duel between sprinters: Mark Cavendish and Pat McCain. The first controversy was raised when Cavendish crossed the finish line on Stage 3 at 130 miles per hour, casting suspicion as to the legitimacy of the performance. In fact, had the local police not thrown a spike strip on the asphalt 60 miles further down the road, there is no telling where the sprinter would have come to a halt. Italian rider Alessandro Mussolini got disqualified for injecting himself with mountain goat blood. 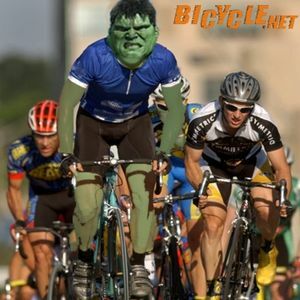 Netherland's Neanderthal Thor Hushovd was devoured by a bear in the Pyrenees. Luckily, his $10,000 bike is safe and sound. Not a scratch on the paint. Hushovd's skeleton was also found in magnificient condition. The bear has been discovered and didn't express any remorses. Fence Legstrong lost control of his machine on a descent and impaled himself on a fence post. He will be missed. Besides these minor events, the competition unfolded between Luxembourg's Lendy Schlack, #23 and Spaniard Alberto Commodore, #64. During the Tourmalet stage, Schlack's team resorted to a rather original tactic by taking the lead and frantically throwing broken glass on the pavement to slow Commodore down. They did not succeed, however, since the Spaniard took an alternate route to go around the mountain. On the next stage, tension reached its paroxysm when Commodore took the opportunity to grab on to a passing train in order to reach Grenoble with a sizeable lead while Team Saxo Bank and Team Leopard were equipped with guns distributed by their directeur sportif's car. Journalists watched in awe as the stage became reminiscent of a John Wayne movie. Incredibly, no casualties were reported as the cyclists proved themselves to be very poor marksmen: the recoil sent them flying off their bikes. The last stage saw a truce occur between Schlack's and Commodore's team. Both rode in front of the pack in an impressive display of sportsmanship and gentlemanly conduct. Pleasantries were exchanged and as the ageless tradition on the Tour de France dictates, the last stage had the look of a lazy Sunday ride and it genuinely seemed like Schlack was not about to challenge the small lead his newfound Spaniard friend had. Commodore didn't see that one coming! 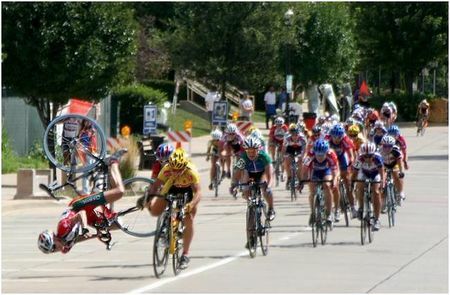 The peloton came to within a mile of the finish line to a festive ambiance, smiles on their faces and hands in the air saluting the crowd as Schlack made a move that would switch the mood around: he quickly reached in the pockets of his jersey to take out a metal rod and stick it in Commodore's front wheel! The unsuspecting Spaniard flew in the air and came crashing down face first, shattering his victory hopes and his jawbone. Boos and various objects stormed the podium as Schlack accepted the Maillot Jaune, a relic given to the Tour's winner. "He should learn never to trust a Schlack!" said the Luxhamburger while being escorted out by security with a raging crowd on his heels.